I love standing at the door of the sanctuary on Sunday mornings welcoming long-timers and new-comers into the church, joking around with the greeters and ushers, and feeling the power of the community as it flows together into the sanctuary. Sharing a worship experience is one way congregations build community. Having a variety of ways for new people (and long-timers for that matter) to enter into small-scale communities – such as covenant groups, adult religious education classes, choir, and one-time events like retreats and service projects – enables new people to find their place in the congregational system, enriches the fabric of community, and grows the congregation. In the current era in Western Culture, there are fewer opportunities to build multigenerational community then ever before. Outside of family, where else do eight-year-olds and eighty-year-olds get to know each other? Where else are teens allowed to lead and adults allowed to be goofy? Where each person, no matter their age, race, economic situation, gender expression, or sexual orientation, is lifted up as having worth and dignity and offered a chance to play a role in building the beloved community? Community-building outside the walls of the congregation is also vital, whether partnering with a neighborhood organization to beautify the streets or organizing with an affordable housing nonprofit around a local ballot initiative. 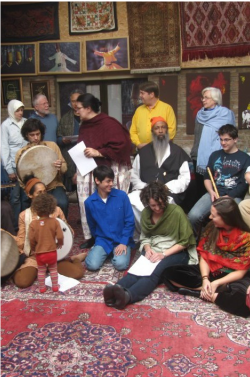 UU congregations also serve as good members of, and neutral ground for, interfaith coalitions. Building multi-religious community deepens our own faith and helps us to be present when crisis strikes our siblings in faith, such as during the racist massacre at Mother Emmanuel AME church, or when a Mosque has been defaced. Building community, organizing, and creating accountable relationships outside the walls of our congregations is the only way we can make an impact on injustice in the world.